As a SysAdmin I find that a lot of my job requires patience. Patience because I often have to teach and tutor less tech-savvy colleagues about how their computer works and how they can make it better work for them. This is often achieved by using shortcuts, favorites, keystrokes and other quick-access ways of doing things hidden all over Windows and Office. 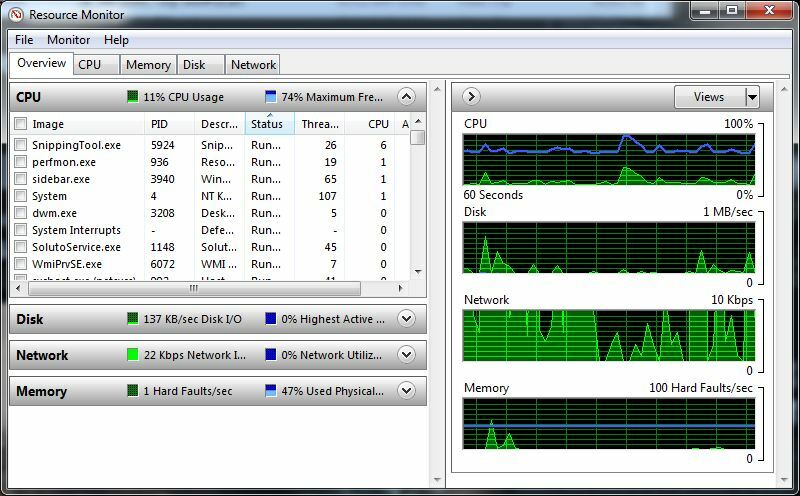 One thing that I find invaluable yet I find others find to be the stuff of ‘IT black magic’ is the use of the task manager and also its even lesser known companion, Windows Resource Monitor. These are tools that are invaluable to troubleshoot, determine problems, find performance bottlenecks and also to just figure out what the hell is going on. Quite often I find myself being summoned to investigate something, at which point I ask a few questions, look at the system, furrow my brow and promptly check the Task Manager and sometimes the Resource Monitor to see what’s happening. It is at this point that I often find that peoples eyes glaze over like they are witnessing me re-animate the dead. it’s an eerie silence that I often find more comforting by making small talk and asking how they are etc while I deal with the issue at hand (This also reinforces my appearance of the ‘approachable IT guy’). Still, I’ve always reckoned that more people should learn how to use these 2 particularly great tools that are build right into Windows Vista and Windows 7! So, I was with great pleasure when TechRepublic published a 4-part article explaining the various parts of the Resource Monitor tool. I recommend that all read it! Here are links to the 4 parts, and I suggest you read them!